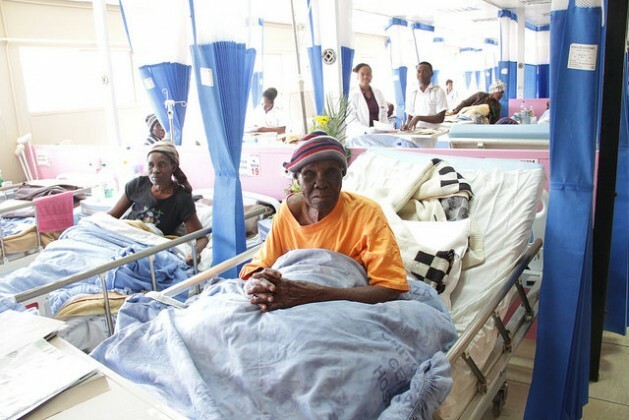 HARARE, Jan 25 2015 (IPS) - About eight years ago, 44-year-old Tilda Chihota was struck with tuberculosis which kept her bed-ridden for over six months at her rural home in Zimbabwe’s Mwenezi district, 144 kilometres southwest of Masvingo, the country’s oldest town. Although Chihota later recovered after receiving treatment at a local district hospital here, early this year, she was once again struck with the same ailment. This time is came with increased severity in the form of multi-drug-resistant tuberculosis (MDR-TB). MDR-TB occurs when a strain of TB bacteria becomes resistant to two or more “first-line” antibiotic drugs prescribed to combat standard TB. According to the Ministry of Health and Child Welfare, cases of MDR-TB nearly doubled from 156 in 2011 to 244 cases in 2013. This was despite the fact that notifications for ordinary TB drastically declined from 47,000 in 2010 to 38,367 in 2012. “I am HIV-positive, but because I defaulted on taking treatment drugs, doctors have diagnosed me with MDR-TB,” Chihota told IPS. Cases of MDR-TB like Chihota’s are common among people who are living with HIV/AIDS, according to the United Nations AIDS organisation (UNAIDS). Close to 80 percent of TB patients in the care of Doctors Without Borders are co-infected with HIV/AIDS. “The best way of avoiding MDR-TB is prevention through strict adherence to prescribed treatment by the health provider,” Dr. Charles Sandy, deputy director for the AIDS and TB unit in Zimbabwe’s Health ministry, told IPS. According to the World Health Organisation (WHO), it takes longer to treat MDR-TB, which can only be cured with the use of very expensive second line drugs that often cause serious side effects. These include nausea, vomiting and permanent deafness, which often deters patients from finishing their treatment course. On average, patients need to take between 12 and 15 tablets daily for two years, which cost about 5,000 dollars for the entire course. “The treatment drugs required per each MDR-TB patient are quite expensive and involve the use of quantities of resources enough to treat more than 100 TB patients, which is a strain on government’s public health sector,” Everson Murwira, a local health inspector based in Gweru, a town 222 kilometres west of Harare, the Zimbabwean capital, told IPS. Medical doctors also point out a litany of many other factors fuelling rising cases of MDR-TB here. “Food insecurity, large numbers of Zimbabwe’s population living in destitution, lack of balanced diet and crowded and often poorly ventilated homes in both the countryside and high density suburbs in cities leads to TB patients not recovering, but rather further suffering from MDR-TB,” Tinashe Chauke, a private medical doctor often treating TB patients in Masvingo, told IPS. But government could be doing more to combat TB. At last year’s World TB Day commemorations, Health Minister Dr. David Parirenyatwa expressed concern at the number of missed TB cases here, saying that based on WHO projections, Zimbabwe missed 30,000 TB cases in 2013 alone. “We continue to miss TB cases because of stigma and lack of awareness in the community and limitations in access to health services as well as the quality of health services,” Dr. Parirenyatwa said at the time. World Tuberculosis Day falls on Mar. 24 each year. Médecins Sans Frontières (MSF or Doctors without Borders in English) says direct observed treatment is the best model to manage MDR-TB. “Direct observed treatment of MDR-TB patients in their homes by their loved ones is the best option, but in Zimbabwe, only doctors and nurses can inject patients and nobody else, which creates a challenge for patients,” an MSF medical doctor in Harare, speaking on the condition of anonymity, told IPS. With the help of MSF two years ago, 3,200 patients in Zimbabwe were placed under treatment for TB while 63 patients were treated of MDR-TB. Government cooperation with MSF, however, has been spotty. In a recent case, an MSF clinic in Beitbridge district near the South African border that treated HIV/AIDS and TB was forced to close after government officials accused the clinic of meddling in politics. According to MSF, Zimbabwe trails behind other countries in Southern Africa in its response to TB. Diagnostics need improving and treatment needs to be decentralised to community levels, the health agency said in a recent report. A 2010 UNICEF report revealed that 78 percent of Zimbabwe’s 13 million people were living in ‘absolute poverty’, following which the WHO global tuberculosis report of 2012 placed Zimbabwe’s estimated TB incidence per capita at 603 per 100,000 population. “Besides inadequate medical facilities, there are also many cases where sick people have needlessly died because they could not access medical attention due to bad or nonexistent roads,” said Edmond Kabarapate, the village head of Kafurambanje Village, said in a recent press interview. Although Zimbabwe has made significant strides in reducing HIV/AIDS infections to 15.6 percent from 16 percent in 2007, according to the United Nations Development Programme (UNDP), it is still a sad story for this country as it contends with the menace of MDR-TB. “MDR-TB cases will continue to increase and worsen as long as the backlog of TB cases keeps increasing,” Dr. Sandy told IPS. Evident of Dr Sandy’s sentiments, the 2009 WHO Global TB Control Report rated Zimbabwe as having the fourth highest incidence of TB in the world. In 2012, the WHO reported that the Southern African nation was amongst 22 countries referred to as the TB “high burden” countries. Caught up in difficult health situations, especially MDR-TB, many Zimbabweans like Chihota are unsure whether or not they will live after contracting the disease. “Whether for better or for worse, with the MDR-TB that is wasting me away, taking the complex treatment prescribed to me, I am still very uncertain about what the future holds in as far as my state of health and even my survival is concerned,” Chihota told IPS. It’s actually Ministry of Health and Child Care (MOHCC).